Breaking News!! Bangladesh Secondary School certificate SSC Result 2017 to be published May 4, 2017, Thursday. This SSC Result publish date confirmed by Education board minister Nurul Islam Nahid. At the same time, Dakhil Result 2017 will be also published with SSC Result 2017. Education minister Nahid said, on 4th May morning 10:00 AM, I will hand over the full result sheet with prime minister Sheikh Hasina. We've received some message from last few days, The candidates of SSC exam they want to know the SSC Exam Result 2017 publish date. Finally, the official publish date is announced. Now, I hope they happy to see the SSC Results 2017 publish date. SSC and Dakhil Exam Result to be published 4 May 2017. In this news, I'll also show you how to collect SSC Result 2017 bd with some available method. You can easily collect your result with full mark sheet via Online internet, Mobile SMS, Via Teletalk, Via eboardresults.com and Android apps. Before that, Now let me elaborate this year SSC exam results details. Here is a short review about SSC Exam 2017. Finally, Bangladesh education board going to publish the SSC Result 2017 bd. Secondary School Certificate exam is a most important exam for all students. After passing the exam, they can admit into Higher secondary certificate education. Before that, you should need to admit into call 11. Here is HSC Admission circular 2017-18 for you. In here you can learn how to collect SSC Result 2017 of Bangladesh education board results all education board. In this year SSC Exam Results got publishing withing 60 days. This is the first time of Education board Bangladesh, that publish their result withing 2 months. Till last year, they publish their result withing 90 days. This year they changed the role. Now every year all public examination result will publish within 2 months of end exam. So dear guys, Now got ready for collect your SSC Result 2017 Bangladesh for all education board. Here you can check SSC Result 2017 for all education board BD (included Madrasah and Technical Board). Here I am sharing all available and easiest method for Check SSC 2017 Result. Nowadays, Online internet is the best way for collect any education board results of Bangladesh. Don't worry, I am sharing all methods for you. On 4th May SSC Results will officially publish at 10:00 AM. But you'll get your desired result after 12:00 PM via SMS and after 2:00 PM by the internet. In below I detailed step by step, How to collect your SSC Exam Result 2017. ➦ Step3: Select 2017 on Year column. I hope you got understand about how to collect SSC Result 2017 with the official website of Bangladesh Ministry of education. On the result day, you may face some server problem with this site. But don't be afraid. Here is alternative website is available for you. and this is eboardresults.com. Another popular website collects any public result. Now see how to collect SSC Result 2017 by SMS. SMS method is an easy method for check any SSC Result 2017 by SMS. Because of, The result first time publish on SMS, after that on the internet. 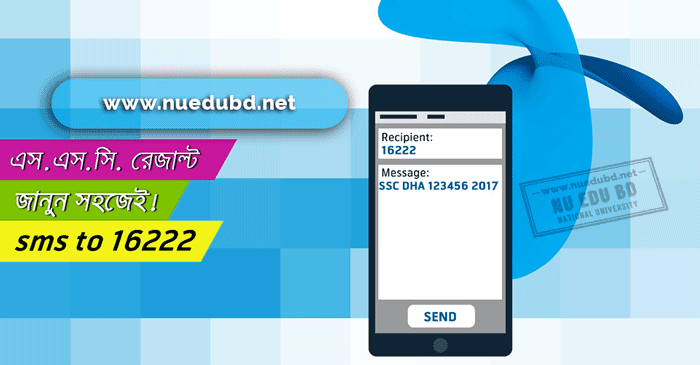 If you have any smartphone, then you can easily check your SSC Exam Result by sending a simple SMS from any operator of Bangladesh. If you send the SMS from Teletalk SIM, then you see results fast than other operators. Remember that, every SMS will charge 2.50 BDT with VAT and SD charge. Now note the full format of check SSC Result 2017 by SMS. SSC<space>DHA<space>REG NO<space>2017 send to 16222. DAKHIL<space>MAD<space>REG NO<space>2017 sent to 16222. SSC<space>TECH<space>REG NO<space>2017 sent to 16222. Now I am trying to give a simple review for SSC Result 2017 all boards. Here I am also sharing all education board's 1st three letters. It will need you when you want to check your SSC Results by SMS. If you don't know your board's shortcodes, then you can note this from here. It is very essential for SSC Result 2017 BD. Now, let's start. We till not received the pass rate of SSC Results 2017 all education board. Once we received the rate, then we'll update it here immediately. I hope you got helped by found this use full news for your SSC and Dakhil Exam Result. In conclusion, Secondary school certificate exam is most important in you life. It will be needed at your every education sector. If you make a good result on SSC, then you'll get best facilities than others. I hope your exam was good and this article will help you for check your SSC Exam Result 2017. If you have any questions, then leave that using comment section. I'll reply you ASAP. I wish you best of luck for you and your exam.